Explore this technique of netting to create a basic triangle for use as earrings, a feature toggle or as a beaded bead as part of a necklace or bracelet. 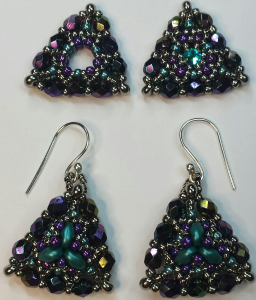 Vary the basic design using two-hole beads (Superduos) or montees for some added bling. See requirements list and tutor details here. Different ways to connect as a bracelet or as a feature piece will be shown. Intermediate students will cope best with this technique. The ability to work with small beads and follow and retrace a set thread path is required, but full instructions will be supplied. BYO light is suggested. We will supply power boards and extension cords.